For those flying into or out of Suva, you will be using the Nausori international airport... a fj$30 cab ride from central Suva hotels such as Holiday inn, Tanoa etc. While this is classed as an "international" airport, you might be forgiven for assuming it's just a small hub servicing domestic flights. Very small, the only international flights that we are aware of are a few weekly flights to neighboring islands. 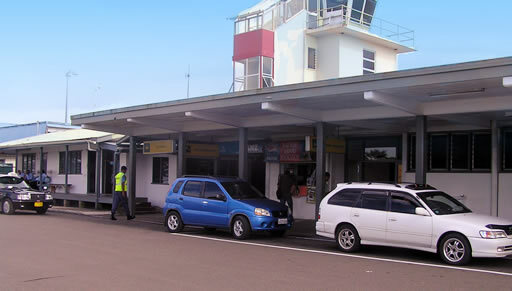 The majority of flights into Fiji land at Nadi, and use a domestic flight to connect with Suva (Nadi-Suva is a 30 minute flight time). There really isn't a whole lot more to add about the airport... small, plenty of parking, and with a taxi stand outside the arrivals terminal. At this point, we might have provided an airport layout map. However, as you can probably see everything from the central area, there didn't seem to be much point in doing it.... you are not going to get lost. Wi-fi is only available through the airport computer, and it's expensive at fj$5 for 30 minutes. Not only that, it's located in a busy section of the building, so you have no privacy. Far better, is to bring your own 3G dongle and sit in the cafe with a cup of coffee to do your internet surfing. There are always cabs on the ranks outside the airport, a trip to one of the Suva hotels (Holiday Inn for example) will cost you around fj$30. You will find the usual car rental firms here, along with one or two local firms, such as Khans. With Air Fiji just starting a new route direct from Australia to Suva, the place may have to upgrade their transport services to cope with the extra visitors. 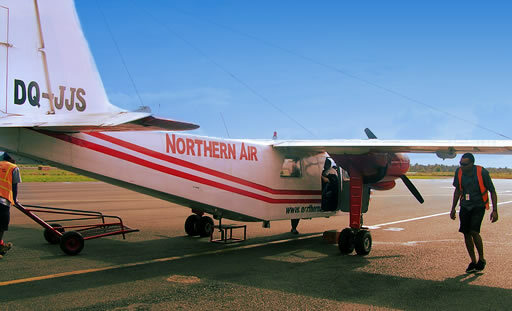 If you are on one of these Australian flights and want to get to the other side of Viti Levu, (Coral Coast, Nadi or Denarau) then there are a couple of Nadi based transfer services that can meet you at Nausori to transport you. See out Nadi airport transport page for details on prices and how to book.